Lisson Gallery now represents the estate of the Italian painter Antonio Calderara and are showing some of his work now at 67 Lisson Street. Featuring key works from the late 1950s to the early 1970s, the exhibition will highlight an important period in Calderara’s practice, namely his shift from figuration to abstraction. Encompassing oil paintings and works on paper, the exhibition will be accompanied by a publication that outlines this period of Calderara’s life and career. 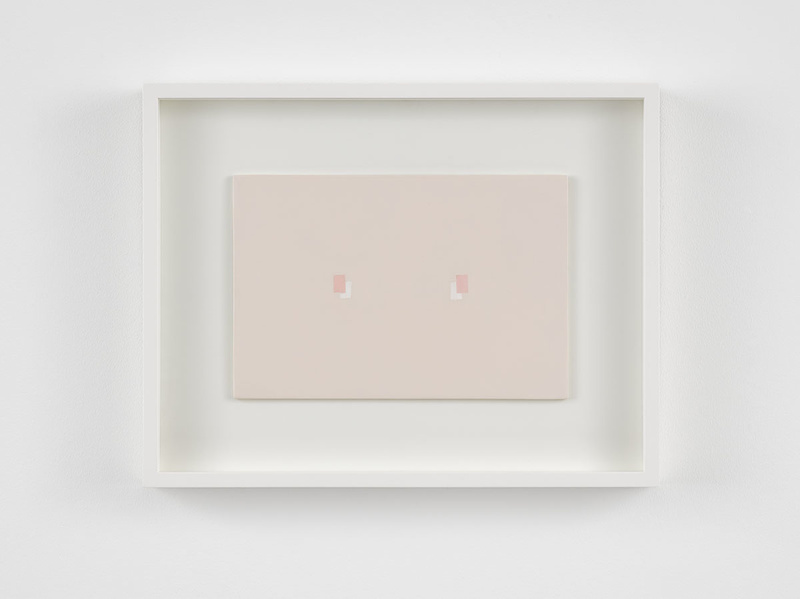 Self-taught as a child growing up in Milan, and later mentored for a time by a young Lucio Fontana, Calderara’s earliest influences were of the figuration and light effects of Piero della Francesca, Seurat and the Milanese Novecento painters. After abandoning his university studies in engineering in 1925 the young man dedicated himself fully to experimenting with colour and form. 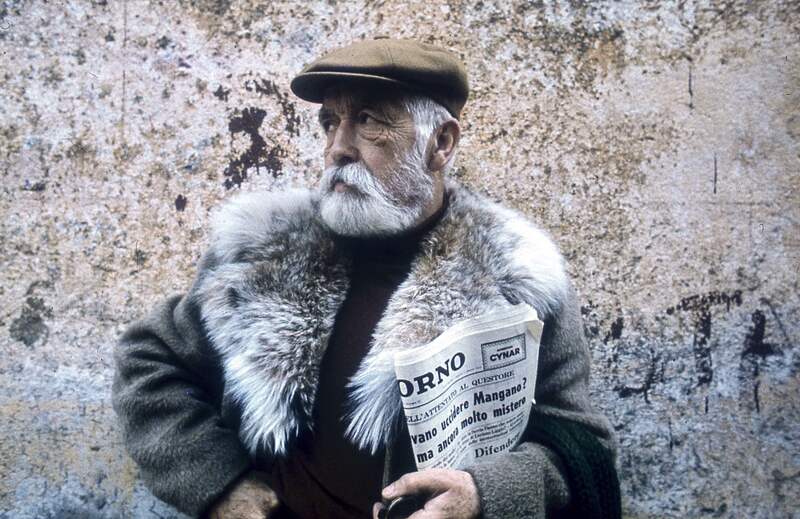 Through portraiture, landscapes and still lifes, Calderara depicted the people, scenes and objects of his native Italy – all suffused by a delicate, misty light inspired by the atmospheric glow of Lake Orta in Vacciago, where the artist moved in 1934 with his wife Carmela, and where he would work for most of his life. By the mid-1950s, Calderara began to move away from figurative painting to embrace a more geometric approach, radically reducing both the scale and the compositional elements of his paintings through use of simple forms and flat blocks of nebulous and subtle colour. Situated neither within Constructivist nor Minimalist movements, his pared-down vocabulary of lines and squares, refined colour palette and precise measurements nevertheless positioned Calderara closely with other minimalist painters at the time, including Piet Mondrian and Josef Albers, both of whom the artist admired greatly. 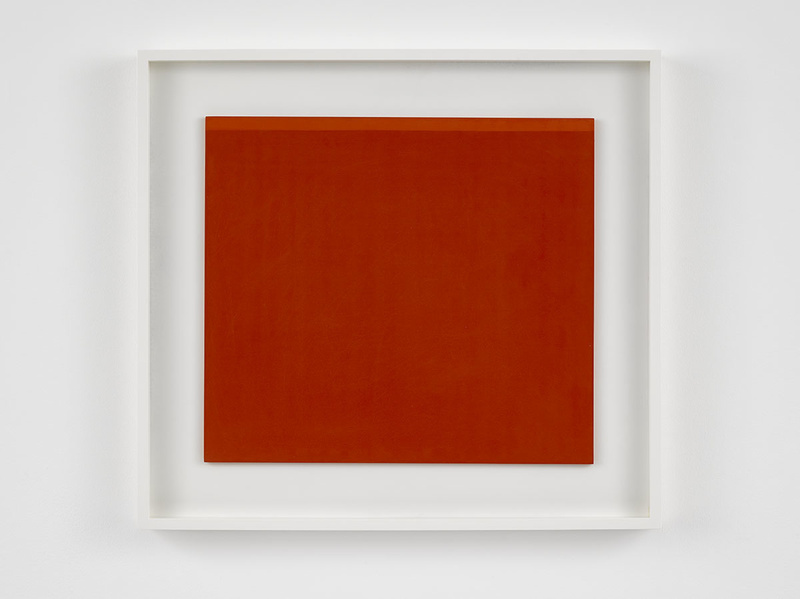 Such singular geometric lyricism came to the fore in Calderara’s seminal work Painting Infinity, which he created in 1959 at the age of 56 – the same year he created his first fully abstract painting, Quadrati e Rettangoli. Here Calderara incorporated the Velatura technique from Northern Italian Renaissance and early Flemish portrait painting – a process that consists of the application of multiple layers of a single pigment and white to create an ethereal, milky glaze – using it instead for abstract means. Rather than aspiring to create overtly discrete geometric forms, Calderara wanted instead to express the ‘human measure of light and space’, two themes that came to characterise the artist’s work and remained key subjects throughout his lifetime. After encountering and befriending artists from Fontana’s circle including Piero Manzoni and Enrico Castellani in the early 1960s, Calderara began to further reduce the depth of his backgrounds, with more focus given to the visual plane of the foreground, while reincorporating landscapes and horizons. Two important series, Attrazione in Tensione (1963-1966) and Orizonti (1969), which feature quadratic, square-shaped areas of colour, capture space both from above and at a distance, thus encapsulating either a whole entity, or nothing at all. Later in life, and with failing health, Calderara began to focus on watercolours, a medium that perfectly captured the subtleties of transparency, washed with an equal, uniform treatment. Reminiscent of paintings by Kazimir Malevich, Calderara liberated colour from an object to become a pure phenomenon of light. The legacy of this important Italian artist is preserved through the Fondazione Antonio and Carmela Calderara, the artist’s former home and studio housed within a 17th-Century villa-cloister of Vacciago, North of Milan. The collection includes many of Calderara’s own works, plus more than 300 artworks by dozens of international artists with whom he had relationships of friendship and esteem, all joined together by a general tendency towards abstraction. 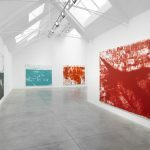 Established in 1979 by Giuseppe Alemani, the foundation organises an annual programme of exhibitions and is open to the public from May until October each year. Born in 1903 in Abbiategrasso, Italy, Antonio Calderara continued to work up until his death in 1978. 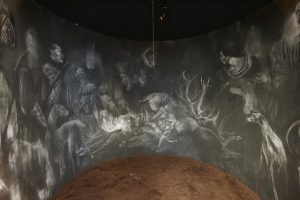 Calderara’s work was included in the Venice Biennale in 1948 and in 1969, in Documenta 4 in 1968, and a retrospective the following year at Kunstmuseum Lucerne confirmed his status as an artist of international importance. Other solo exhibitions have been staged at a number of institutions worldwide, including the Museo d’Arte Moderna, Rio de Janeiro, Brazil (1965); Stedelijk Museum, Schiedam, Netherlands (1968); Kunsthalle Bern, Switzerland (1969); Kunstmuseum Düsseldorf, Germany (1973); ICA, London, UK (1974); Contemporary Art Museum of Genoa, Italy (1995); Pinakothek der Moderne, Munich, Germany (2003); and Fondazione Zappettini, Milan, Italy (2011); and MASI, Lugao, Switzerland (2016). Most recently his work has been the subject of a solo exhibition at Kunstmuseum Winterthur in Switzerland (February – May 2017). His work is featured in numerous private collections, as well as the R&B Collection and Sammlung Hackenberg in Munich, Germany; P420 Art Gallery, Bologna, Italy and the Josef Albers Museum in Bottrop, Germany. 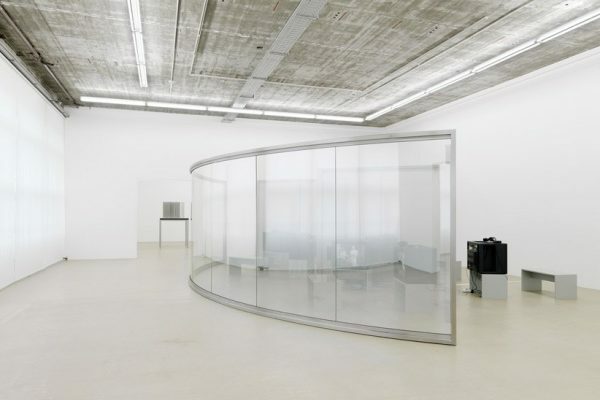 This entry was posted in EXHIBITIONS and tagged Antonio Calderara, Lisson Gallery. Bookmark the permalink. ← New monumental Ai Weiwei exhibition focussed on public and urban interventions opens.